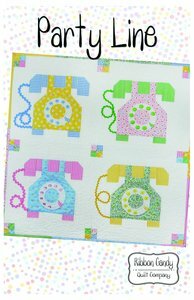 Stay connected to all your friends with this cute new quilt "Party Line". Easy to follow stitch and flip method instructions make this quilt a must on your quilt list. Adorn your phones with cute rick rack and colored buttons. Fusible web applique is used on the rounds of the phone. Finished size is 30" x 30".